Does the short summer season have you stressed? Do thoughts of the months of weeding ahead make your back ache in anticipation? If so, don't sweat it. Think mulch! Mulch is a great timesaver for the gardener – a layer of mulch helps reduce the need to weed and water, and helps make a landscape look more polished. With a little preparation and a good mulching plan in hand, you can wave away those seasonal woes and showcase your hard work. In layman's terms, mulch is simply a protective layer of inorganic or organic material laid over the soil for protection. 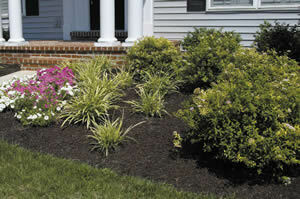 Mulch can be anything from pine needles and wood chips to plastic sheeting and recycled rubber. When applied correctly, mulch provides a wide range of benefits, says Stephen Brown, PhD, the district agriculture agent for the Cooperative Extension Service at the University of Alaska Fairbanks. "Mulching protects plants," he says. "It helps prevent the loss of soil moisture, it slows weed growth, and (in turn) it reduces the need for chemicals." Mulching can stop weeds before they even start growing. Using mulch covers up the areas around your plant and that lack of sunlight means weed seed can't germinate and grow. Just make sure to weed before applying mulch. Mulched plants tend to have more roots and the same mulch that will help your plants to grow will also assist any weeds left behind. However, once the mulch is in place, it will suppress weeds, saving you time and effort. Even though there is a multitude of mulches available, Anchorage horticulturist Debbie Hinchey of Debbie's Horticulture Service advocates green and plenty of it. First, Hinchey advises home gardeners to dry out the winter debris cleaned out of their gardens, then shred it and reapply it as summer mulch. As the organic mulch decays and your lawn comes in, Hinchey suggests adding a layer of grass clippings to the mix. "I'm a big fan of grass clippings," she says. "By recycling, it keeps them out of the landfills, and it is very, very good for the soil. When it breaks down, it adds nutrients to the soil, which is then available to the plants." By laying fresh clippings in your beds, you get the benefit of the added nitrogen in your soil and the clippings mat together, keeping the soil below from crusting. "Mulching keeps the soil cool and it doesn't dry out as fast," she says. Don't like the look of grass clippings, but think bare dirt surrounding your shrubs and perennials looks drab? If so, think about applying a more attractive mulch. Mulch has come a long way from the original grass clippings and peat moss. Today's decorative varieties include dyed wood bark, geotextiles, pine straw, pecan hulls, cocoa beans, shredded hardwood, crushed stones, and recycled rubber – all adding interest and custom texture to garden landscapes. "Depending on the materials you use and by varying different colors and textures, you can use mulch to create a very pretty picture," says Brown. "Most people don't really stop to consider it, but using mulch is like putting paint on a palette. It creates the background scene for the garden." Check with your local nursery or gardening club to find the best mulch for your landscaping needs and soon you'll be showcasing your summer best.